OMG JOE MAUER HIT A GRAND SLAM AND THE TWINS CRUSHED THE YANKEES!!!!! YESSSSSSSSSSSSSSS!!!!! Let’s just get right to the granny, shall we? Stuff like this is exactly why we keep paying attention. For all we know, this could very well be Joe’s last season. I’d bet on him being a part of the 2019 Twins, but until we have a definitive answer on his future I’m going to make sure to soak it all up, just in case. 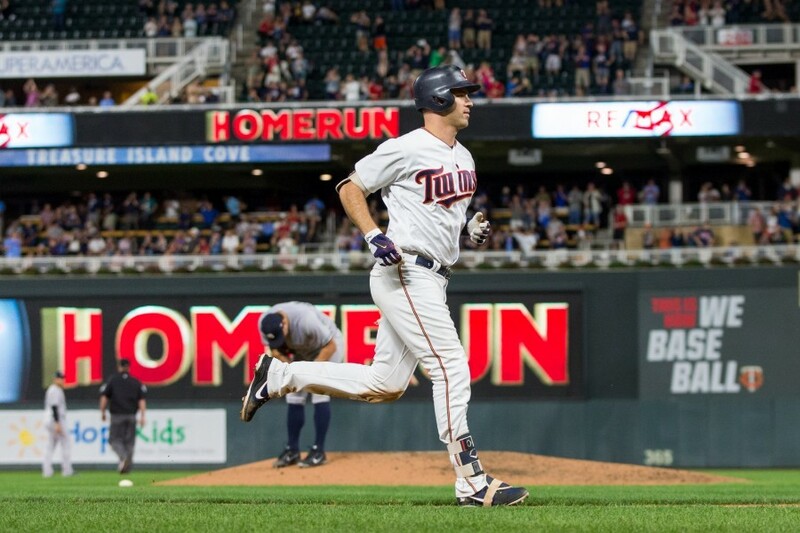 Mauer’s grand slam, the fifth of his career, put the Twins up 10-1 in the bottom of the fifth inning. The only problem was there was so much game left to be played. The Yankees fired right back in the top of the sixth inning with a grand slam of their own coming off the bat of Didi Gregorius. Thankfully, that was all the more offense New York would deliver. Stewart just could not find the zone, throwing just 46 percent of his pitches for strikes. That’s the last thing you want to see when your team builds a 10-1 lead. Stewart loaded the bases with one out in the sixth inning, then was lifted for May, who gave up the grand slam. Forget the opener, at this point the pitching gimmick I’m most interested in seeing in 2019 is Taylor Rogers pitching a borderline irresponsible number of innings. We’re talking Mike Marshall levels. He’d probably break down before too long under those circumstances, but Rogers has been so incredible of late. He now has 21 straight scoreless appearances. Hildy has also got things back on track of late. He went through a stretch last month in which he gave up multiple runs in four straight appearances. Since then, Hildenberger has only surrendered one earned run on three hits over 10 ⅓ innings. Mauer, Jorge Polanco, Robbie Grossman and Max Kepler all reached base three times. 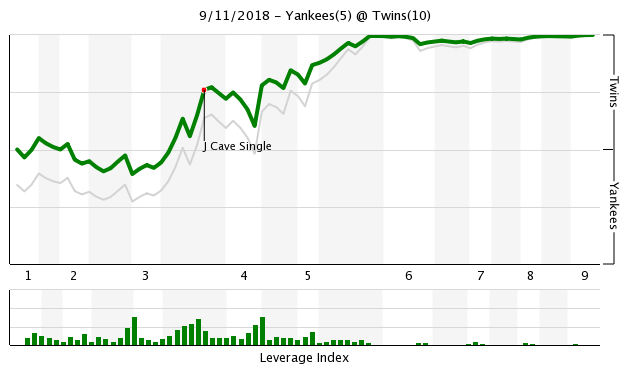 Jake Cave had two hits and stole a base. Every one of our "openers" has put the Twins in an early hole. Hint: the strategy doesn't work if your bullpen is terrible. Great to see Joe crank one out against the Yanks no less. Very nice moment. Hey, let's take 2-of-3 and win one tonight! Duffey did well in the role and allowed Stewart to begin with the 8 and 9 hitters. I think it worked the way it is supposed to last night. What's to hate about the Yankees?An owner that puts a competitive team on the field year after year?Stanton, Judge, Hicks, Gregorios? But they're still the Yankees. Please don't ruin Taylor Rodgers. This is what I've been thinking about today after reading on this site about the great run he's been on. I think both Rogers and Hildenberger have proven to be reliable and useful bullpen pieces. Let's hope Molly can practice some restraint with them the rest of the way. Joe's earned his place here, I'd say. When you add them all up years from now and ask who were the great ones, he'll be among the Twins top five. How much more do you want out of a guy? Among the Twins top 5 are 4 Hall of Famers and one more who probably should be. Mauer isn’t a slam dunk Hall of Famer. Bert probably should have been. He had 11 seasons bWAR above 5. Joe has had 5. Tony O also had 5 seasons of bWAR above 5 - out of 11 seasons with more than 130 PA.
Joe doesn’t have a good HOF comp. a guy who was a an exceptional catcher for roughly half of his career and then a barely replacement level first baseman for the second half. If Mauer had been forced to retire 6-7 years ago, he probably would already be in the Hall of Fame. The longer he sticks around, the LESS likely he gets in IMO. Okay. How 'bout we put him in the top six?